Students listen to personal friends and family of Ausborn speak. 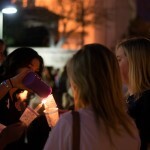 Georgia State students, faculty, and community members gathered this Sunday evening to hold a candlelight vigil for Coordinator of Greek Life Lucille Whiten Ausborn. 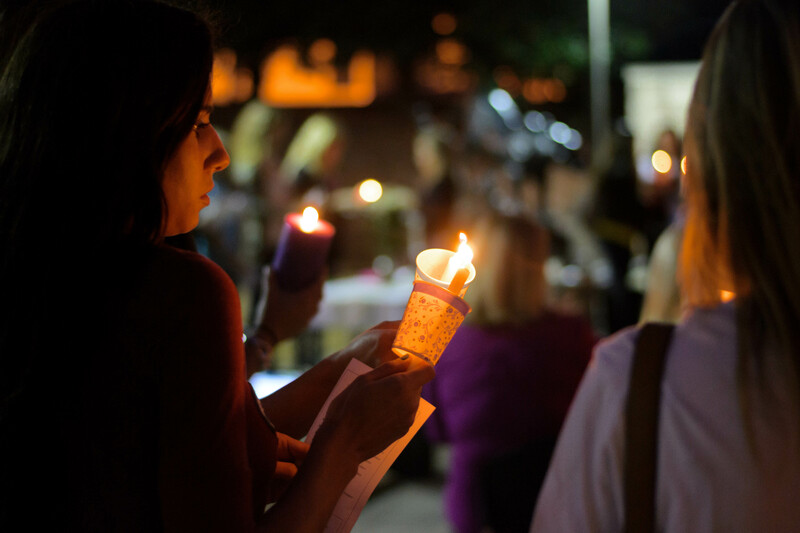 Students, friends, and family of Ausborn lit candles in her memory after hearing opening statements by Umama Kibria, Phi Mu Alumnae Relations Chair. Greek Week, initiated during the time Ausborn held her post, is an annual GSU event that is the result of the collaboration of all of State’s fraternities and sororities. The event promotes cooperation between Greek organizations and allows students an opportunity to learn more about Greek life and how they can get involved. Over 150 students, Greek and non-Greek members, faculty, friends and family of Ausborn attended the ceremony. Head of Ausborn’s sorority, Kris Bridges, Phi Mu National president, also was in attendance and shared her thoughts. “We are so grateful to Lucille and what she was able to accomplish here at Georgia State. We are very proud of her as a Phi Mu and she truly lived by our creed, being such a positive influence to so many women and men in the entire community. We are very saddened by her loss and proud of the changes and impact she had on the Georgia State community.” Bridges said. Family members of Ausborn were in attendance as well and said they were thankful for such a wonderful event honoring Lucille. Ausborn graduated from Western Carolina University and held two positions at Western Georgia University before arriving at Georgia State on April of 2010 where she was responsible for advising Greek organization leaders and members. The Phi Mu chapter at State will be holding a closed ceremony for Phi Mu members and alumnae on Tuesday, January 15th at 7 P.M. in the Student Center. 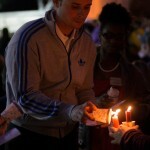 Matthew Robison, assistant dean of students, helps students light their candles. 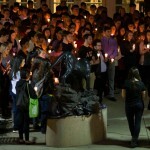 Students share the light that they said represented Ausborn’s personality. 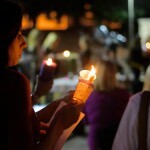 About 150 people attended the candlelight vigil in Ausborn’s honor.